Alexis Ohanian, reddit co-founder, on solving America’s innovation crisis. 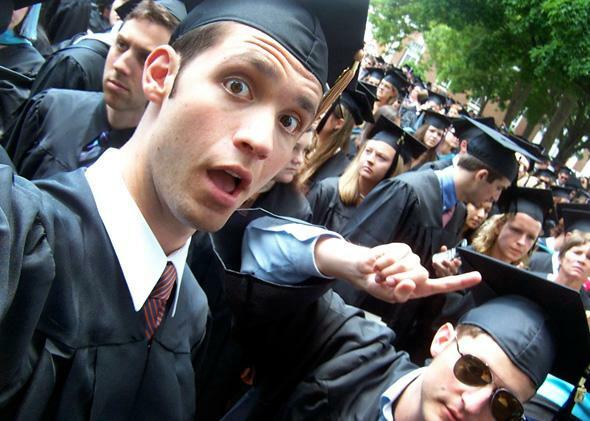 Reddit’s co-founder has a solution to the innovation crisis in the U.S.
Alexis Ohanian graduating from the University of Virginia in 2005. The skills needed to be successful today are rapidly evolving, which is why education has never been more important—especially for those in the technology industry, where I’m lucky enough to work. Companies (at least the kind ambitious people want to work for) no longer look for someone to come in from 9 to 5 and uphold the status quo. They want resourceful and innovative employees who work hard and get their jobs done regardless of the circumstances. To baby boomers, these trends are scary, eating away at the foundation of a steady job and life that they helped instill. But we millennials welcome these new paradigms because they instantly show who is resourceful and who isn’t—who will go the extra mile and who will coast to the finish. For the people with the skills to succeed, life is good. Unfortunately, college alone can’t give those skills, and the economy isn’t helping, as promising yet under- or unemployed young adults with six-figure student loan burdens can attest. Meanwhile, people like Bruce Nussbaum, a professor at Parsons and the author of Creative Intelligence, say that America is experiencing an innovation crisis. Meanwhile, higher education is under fire for its narrow focus on rankings and its insane cost. So how can we nurture creative thought in a productive way? Peter Thiel, the billionaire PayPal founder, thinks the answer is paying students to skip college altogether. He set up the Thiel Fellowship, which awards $100,000 each to 20 people under 20 to pursue their dreams. There are two problems with Thiel’s education solution. First, the Thiel Fellowship isn’t scalable. Helping 20 kids a year is great, but more than 21 million students enroll in college each year, so the Thiel Fellowship is only helping less than 0.00000095 percent of students. The second problem is that giving a select number of students the option of going to college or getting $100,000 to work on a business creates a false and harmful dichotomy. The best way to incubate innovation and entrepreneurship is found at the intersection of college and supplemental education. If you sample where today’s resourceful elite—the tech titans starting billion-dollar empires with laptops—got their skills, it’s almost always a combination of college and supplemental education, like learning how to code with Codeacademy and taking practical classes at places like General Assembly. (Disclosure: I’m an investor in both companies.) The most promising businesses are either building programs for their employees or encouraging them to take supplemental courses to continue learning. These programs, especially in software development, don’t offer accreditation—they offer the skills to make careers. But this doesn’t mean skipping out on traditional higher education. Although no college is perfect, professors and fellow students teach you really important skills. These crucial four years can go a long way toward turning shy and inexperienced freshmen into well-rounded, connected, and inspired graduates. If I hadn’t attended University of Virginia, where I met my co-founder Steve Huffman, neither reddit nor hipmunk (a travel site Steve co-founded and I joined a week before launch) would exist today. And if Steve hadn’t taught himself how to code using freely available resources, reddit would have never gotten past the idea stage. The same goes for Snapchat founders Evan Spiegel and Bobby Murphy, who met at Stanford, graduated, and then launched the incredibly popular app. Even Mark Zuckerberg, the quintessential example for skipping college, would not have made Facebook if he wasn’t in his dorm with Eduardo Saverin, insulting his fellow students with Facemash. The fact that Zuckerberg dropped out is inconsequential, since he reaped many of the true benefits of college before he left Harvard. This intersection of traditional and supplemental education creates a potent mix for success. Even MOOCs (massive open online courses), which have sparked an array of reactions, have the power to make a huge difference in many people’s lives. For the millions of people both rich and poor who will never have a chance to attend Stanford, MOOCs are democratizing that knowledge and making a big difference. An awesome example of the power of these courses is Battushig Myanganbayar, a 16-year-old living in Mongolia who was one of just 340 students out of 150,000 who aced the MOOC Circuits and Electronics, a sophomore-level class at MIT. Battushig showed the world the early promises of these new forms of education. MOOCs should not replace college all together, but they are going to widen the reach of knowledge like never before. Battushig now attends MIT, demonstrating how new and traditional modes of education reinforce each other. Old-school college doesn’t have to come first. When I was invited to speak on a panel at the White House for a room full of university deans and administrators, everyone applauded when I said that “resourcefulness,” an extremely important skill, was nowhere to be found on report cards or factored in GPAs. Yet resourcefulness is one of the most important skills one can learn, whether she wants to be an entrepreneur or simply lead a successful life. And these forms of supplemental education, like MOOCs and sites like Codeacademy, require a fair amount of self-motivation and resourcefulness on the part of the user. These two traits are habits, and these new forms of education will further develop the values that make students better people, in addition to attractive job applicants. I bring this up because there has been a raging debate recently about the importance of ranking colleges by their return on investment, as in how much graduates earn in salary right out of college. On one level, there are a lot of experiences of college than can’t be quantified, from meeting lifelong friends to taking classes with professors leading their field of study. Conversely, just because someone is making a ton of money doesn’t mean he’s happy, or successful for that matter. There are plenty of thriving artists, even technologists, who aren’t filthy rich. But they are still successful. So it’s with this mindset that I approach the debate over ranking colleges by their graduates’ income. And like my answer above to the changing field of education, my answer here is nuanced as well. (After all, only a Sith deals in absolutes.) It’s important to look at return on investment because the majority of college students are on some sort of financial aid, and they and their families are making substantial sacrifices for the sake of education. But the value students derive from college can’t all be quantified monetarily, and even that value that can be quantified doesn’t all show up the year after graduation. In the 16 months before we sold reddit to Condé Nast, Steve and I didn’t take a salary (unless you count pizza as salary). The return on investment for our educations would have been a fat zero. And the value from the acquisition and the value to the world by having reddit exist would never show up in these measures. Granted, I do realize that the monster Steve and I created eats into global productivity, since 81 million people worldwide are discussing cat photos instead of working. Hopefully, the resources the Internet enables that allowed us to create a website that makes the world less productive will also enable millions of students to master skills they never would have. We need an education solution as ubiquitous as the selfie, only with less duckface.